Ever felt that you had this awesome idea that would help a lot of people if only you could have the team and collective expertise to turn it into an application or a project? 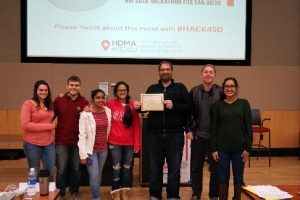 The second Big Data Hackathon for San Diego organized at San Diego State University provided just the platform and resources needed for students and collaborators from varied disciplines to come together and develop projects that will benefit the San Diego community. 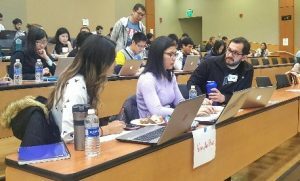 On February 18, 25-26, collaborators from SDSU, University of California San Diego, Texas A&M University, Oregon State University and local high schools joined together to solve problems for public health at the Hackathon. 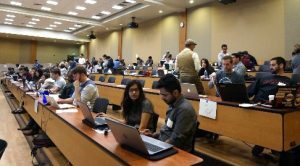 The theme for the hackathon was Public Health and 18 unique, exciting public health ideas for the San Diego community emerged from this event. Ideas ranged from individual health-related concerns such as heart diseases, developmental disorders and mental issues to those targeting specific community needs such as access to safe drinking water, food banks and resources for the veteran community in San Diego. 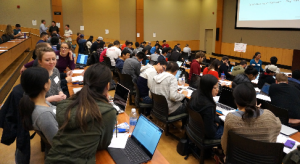 The event offered many resources to help teams turn their ideas into projects – learning stations with technology experts, mentors from the county, the San Diego Regional Data Library, Open San Diego, the ZIP IdeaLab and the overall SDSU academic community. 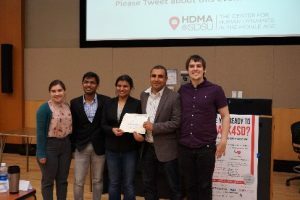 The Center for Human Dynamics in the Mobile Age (HDMA) at SDSU started this hackathon event in 2015 with the goal of getting together like-minded students and experts and developing technology-based solutions to important civic issues in California. Participants generate or use publicly accessible datasets on San Diego, California and the rest of the United States and build their solutions. Participants had a lot of opportunities to gain from participating in this event. 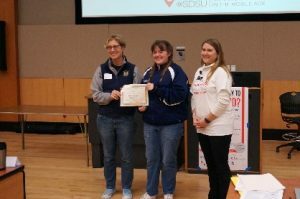 This year’s event featured 18 teams and 125 participants. Six prizes were awarded at the end of the event. 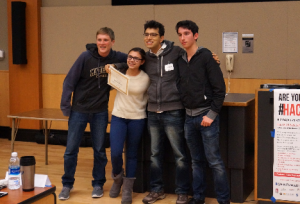 The first prize and the strongest team work prize went to the team ‘The Dude Abides,’ whose idea was to create a texting service to provide information on the location of nearest food banks or health services for the user. The project addresses the area of food security and nutrition. 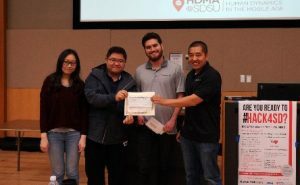 The second prize went to the team ‘Data Pros,’ that created a project that analyzes and gives information on heart disease in San Diego and provides recommendations to having a healthy heart. The project also identifies high risk areas and help potential users make informed decisions about running campaigns and channelizing funds for the cause. The third prize went to the team ‘PathFinders,’ that aims to develop a project that would find alternative biking/walking routes, away from areas known for accidents and air pollution. The prize for the Most Innovative Proposal went to team ‘Watergirlz and 1 Boy,’ that will provide information on locations of water fountain and improve access to safe and free drinking water at schools and parks. ArcBBQ won the prize for the Most Thorough Design and Development, sponsored by Perspectium, for their project on building a dashboard to monitor mental health on related hot topics within the San Diego county.